Opened on 22nd January, 1876, this short-lived building at the junction of Tothill and Victoria Streets in Westminster – across the road from Westminster Abbey, was designed as an entertainment venue offering a space for art exhibitions, concerts and plays in similar fashion to that of the famous Crystal Palace then located in Sydenham. The classically styled and highly ornamented two storey building was designed by Alfred Bedborough and built of Portland stone and red brick. Its initial board of directors included composer Arthur Sullivan (he of Gilbert and Sullivan fame), retailer William Whiteley, and financier Henry Labouchére, covered an area of almost three acres. These tanks, which gave the premises its name as well as its nickname, ‘The Tank’, didn’t prove all that successful. They were initially left empty, prompting author Charles Dickens to note that they become something of a “standing joke”, and even as late as 1896 were described as providing a “beggarly show of fish”. 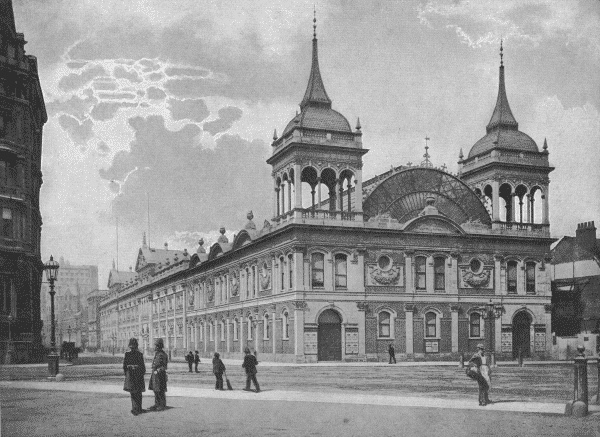 As well as the main hall, the premises also boasted multiple smaller rooms including eating and drinking establishments, an art gallery, ice-skating rink, reading room, telegraph office, and, at its west end, the Aquarium Theatre, which in 1879 was renamed the Imperial Theatre. There was even apparently a division bell installed for MPs visiting from the nearby Houses of Parliament. By the 1890s, the entertainments had become more low-brow and the building had become associated with illicit sexual liaisons. Its popularity declined. In 1903, it was sold to the Methodist Church and Methodist Central Hall was built on the site in 1911. The theatre, however, wasn’t demolished until 1907 – the interior, however, was saved and apparently re-erected as the Imperial Palace of Varieties in Canning Town in 1909 (which itself was destroyed by fire in 1931). PICTURE: A from 1896 book, The Queen’s London: a Pictorial and Descriptive Record of the Streets, Buildings, Parks and Scenery of the Great Metropolis, showing the Royal Aquarium in c1876. 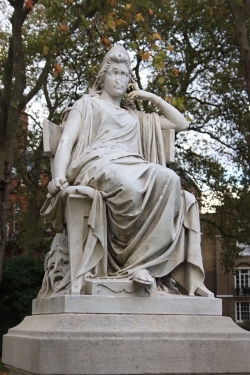 Located on Paddington Green, this statue of 18th century theatrical luminary Sarah Siddons (1755-1831) was unveiled by fellow thespian Sir Henry Irving on 14th June, 1897, who apparently noted that, Shakespeare aside, Siddons was the first actor to be immortalised with a statue in London. It is also said to be the first outdoor statue erected in London of a non-royal woman. Seated in a pose apparently inspired by Joshua Reynolds’ 1784 painting, Mrs Siddons as the Tragic Muse (now in California), the marble statue, which sits on a Portland stone plinth, is the work of French sculptor Leon-Joseph Chavailliaud. The location was apparently selected due to the fact Siddons lived at Westbourne Green from 1805 to 1817 and is buried in St Mary’s Churchyard next to Paddington Green. The Grade II-listed statue, which was paid for by public subscription, is sadly now need of a makeover – Mrs Siddons is missing a nose. There is, incidentally, another, earlier, statue of Mrs Siddons in London – this larger-than-life work, is located in the chapel of St Andrew in Westminster Abbey’s north transept. The work of sculptor Thomas Campbell, it features a standing Mrs Siddons, and dates from 1845. A memorial stone commemorating Nelson Mandela was dedicated at Westminster Abbey on the centenary of his birth this week. Mandela, who spent 27 years in South African prisons and played a key role in bringing an end to apartheid before serving as President between 1994 and 1999, died in 2013. 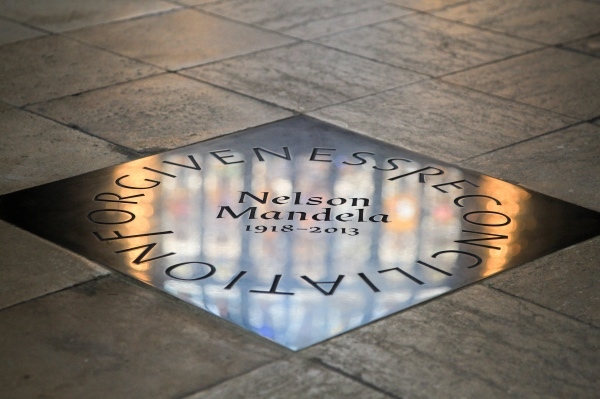 The stone, which is located in the floor of the abbey’s nave, was dedicated in a ceremony on 18th July attended by Nomatemba Tambo, the High Commission for South Africa, and Zamaswazi Dlamini-Mandela, granddaughter of Nelson Mandela. The stone, made of black Belgian marble, was designed and cut by Nicholas Stone. It bears an inscription reading ‘Nelson Mandela 1918-2013’ encircled by the words ‘reconciliation’ and ‘forgiveness’. Mandela is the first South African to be commemorated with a memorial stone in Westminster Abbey. But a statue of South African martyr Manche Masemola stands over the church’s western entrance and Joost de Blank, former Archbishop of Cape Town, is buried outside St George’s Chapel. A service of thanksgiving for the life of Mandela was held at the Abbey on 3rd March 2014. Other monuments to Nelson Mandela in London include a bust located in South Bank and a statue located in Parliament Square. • The new Queen’s Diamond Jubilee Galleries at Westminster Abbey open to the public on Monday. 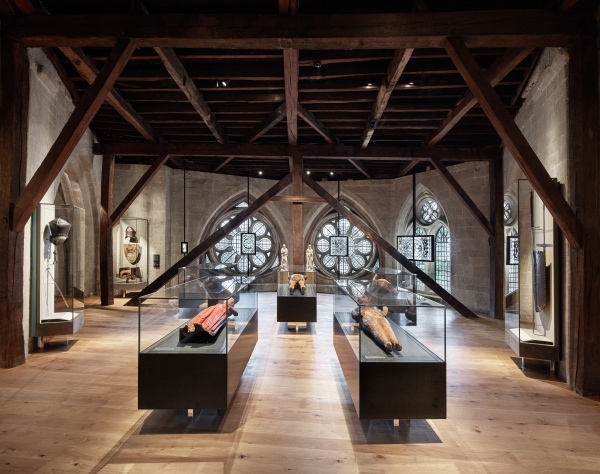 The museum galleries, located more than 50 feet above the abbey’s floor in the medieval Triforium, tell the 1,000 year history of the abbey through some of its greatest treasures. Entry to the Triforium – never before open to the public – is via the new Weston Tower, the first major addition to the abbey since 1745 which comes with previously unseen views of the neighbouring Palace of Westminster. The exhibition in the galleries, meanwhile, features some 300 objects and tells the abbey’s story around four major themes – building the abbey, worship and daily life, the abbey’s relationship to the monarchy and its role as a national place of commemoration and remembrance. Among the items on show are a column capital from the cloister of St Edward the Confessor’s Church (built around 1100), a scale model of the abbey commissioned by Sir Christopher Wren which features a never built massive central spire, The Westminster Retable (1259-69) – the oldest surviving altarpiece in England, the Litlyngton Missal – an illuminated 14th century service book, Queen Mary II’s Coronation Chair dating from 1689, the 2011 marriage licence of the Duke and Duchess of Cambridge, and early abbey guidebooks for visitors. The new galleries and tower were completed in a £22.9 million project funded through private donors and trusts. Admission charge applies. For more, see www.westminster-abbey.org/visit-us/plan-your-visit/the-queens-diamond-jubilee-galleries/. PICTURES: Top – The Queen’s Diamond Jubilee Galleries; Right – The Weston Tower (Images courtesy of Westminster Abbey/Alan Williams). • The Royal Collection’s South Asian art goes on show at the Queen’s Gallery in Buckingham Palace from tomorrow. Splendours of the Subcontinent: A Prince’s Tour of India 1875-6 centres on the historic four month visit made by Albert Edward, Prince of Wales (later King Edward VIII) to the subcontinent prior to his mother, Queen Victoria, being formally declared Empress of India. It brings together some of the finest examples of Indian design and craftsmanship in the Royal Collection including some of the 2,000 gifts presented to the Prince on his tour. Highlights include an enamelled gold and diamond perfume holder given by Ram Singh II, Maharajah of Jaipur, a 10 piece gold service given by the Maharaja of Mysore, and a jewelled walking stick featuring a concealed gun, thought to have been the gift of Maharao Ram Singh of Bundi. There are also enamelled peacock feather fans, a gold and emerald turban ornament, and a brooch and necklace featuring a depiction of the Prince and Princess of Wales. The display can be seen until 14th October. Admission charge applies. The exhibition is being shown alongside Splendours of the Subcontinent: Four Centuries of South Asian Paintings and Manuscripts, which features highlights from the Royal Collection’s world-class holding of paintings and manuscripts from the region. For more, see www.royalcollection.org.uk. • British-born artist Thomas Cole’s depictions of the unspoiled American wilderness form the centre of a new exhibition at The National Gallery. Thomas Cole: Eden to Empire includes 58 works, mostly on loan from North American collections, including his iconic painting cycle The Course of Empire (1834-6), and the masterpiece that secured his reputation (and which has never been seen in the UK before), View from Mount Holyoke, Northampton, Massachusetts, after a Thunderstorm – The Oxbow (1836). Cole’s paintings will be shown alongside those of artists who had the greatest influence on him including JMW Turner and John Constable. Opens on 11th June and runs until 7th October. Admission charge applies. As a bonus, The National Gallery is also hosting a free exhibition of a series of 10 works created by Ed Ruscha in response to Cole’s The Course of Empire. These can be seen in Room 1. Admission is free. For more, see www.nationalgallery.org.uk. • The anniversaries of the four terrorist attacks which took place in London last year – in Westminster, at London Bridge, Finsbury Park and Parsons Green – are being marked from today with a 3D installation on the map area at City Hall. The public are able to pay their respects by signing a digital “book of hope” and interacting with the installation by sending messages of strength, hope and resilience using #LondonUnited on social media, with the messages then projected onto a map of London that #LondonUnited will stand on. The installation, which opens today on the anniversary of the Westminster attack, will remain open until 19th June, the anniversary of the attack in Finsbury Park. Further ‘London United’ exhibitions are also planned for later in the year. “These were not only attacks on our city and our country, but on the very heart of our democracy and the values we cherish most – freedom, justice and tolerance…” said Mayor of London Sadiq Khan. “I hope these arrangements will help people to come together and remember those who were killed and injured, to show solidarity and support for their families and friends and the people whose lives have been affected by these tragic attacks. As we enter this period of remembrance and reflection, we stand together as Londoners, united against terrorism and in hope for the future.” The installation will be open from 8.30am to 6pm Monday to Friday, except Bank Holidays. 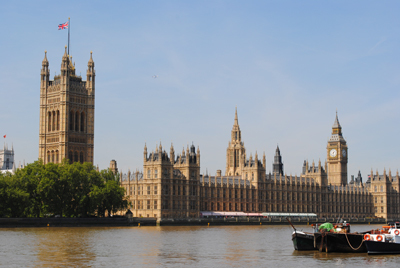 The Westminster attack anniversary is also being marked today with the projection of the phrase #LondonUnited on the Houses of Parliament from dusk until midnight. Further projections will take place on the anniversaries of the other attacks at the sites where they took place. Londoners who may need support, can visit victimsofterrorism.campaign.gov.uk or call 0808 168 9111. • A series of watercolour paintings depicting the interior and precincts of Westminster Abbey have gone on display in the abbey’s chapter house. 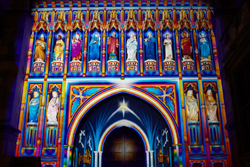 The paintings, by internationally acclaimed British artist Alexander Creswell, represent, in the words of the Dean of Westminster, the Very Reverend Dr John Hall, “the first time ever a large suite of paintings has been commissioned to capture the stunning architecture and amazing light of the Abbey”. They can seen until 16th May. Entrance to the chapter house in the Abbey’s east cloister is free. For more, see www.westminster-abbey.org/events/events/glimpses-of-eternity. Meanwhile the abbey announced last week that there will be a special service of thanksgiving later in the year for the late theoretical physicist Professor Stephen Hawking, who died on 14th March at the age of 76, during which his ashes will be interred near the grave of Sir Isaac Newton. • Numismatics – the study of coins, medals, banknotes and associated objects – is the focus of a new exhibition opening at the British Museum today. Money and Medals: mapping the UK’s numismatic collections celebrates the work of the Money and Medals Network, which provides advice to British museums, and features objects from six participating institutions. They include a framed set of replica Greek coins dating from the late 19th century, a ‘Magic Money Machine’ which can seemingly transform a roll of blank paper into banknotes, a set of medal miniatures from Henry Hook, who won the Victoria Cross for gallantry at the Battle of Rorke’s Drift, and a selection of Roman coins and replica medals of Louis XIV from the collection of the Armagh Robinson Library, founded by Archbishop Richard Robinson in 1771. The exhibition, which is free, can be found in Room 69a and runs until 30th September. For more, see www.britishmuseum.org. 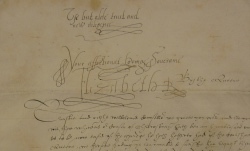 • Forty-three letters written by Queen Elizabeth I and her senior advisors concerning the imprisonment of Mary, Queen of Scots, have been donated to the British Library. Many of the 43 letters were written to Sir Ralph Sadler, who held the Scottish Queen in custody at Tutbury Castle in Staffordshire between 1584-85 prior to her execution in 1587. Four of the letters are signed by Queen Elizabeth I and others are written in the hand of Chief Minister Lord Burghley and Secretary of State, Sir Francis Walsingham. The collection has been on loan to the library for a number of years but has now been gifted by the industrialist and philanthropist Mark Pigott to the American Trust for the British Library. The library plans to digitise the letters and make them available on its Digitised Manuscripts website. • The alteration of books through customisation, decoration or disguise is the subject of a new exhibition opening at the Guildhall Library on Monday. Books: Used and Abused shows how some books have been used as notepads or expanding files while others have become containers. A free ‘book surgery’ advice session will be held at the library on 22nd February for people to learn about their own ‘used and abused’ books and how to repair them. Runs until 9th March. Entry is free (booking required for the free advice session). For more, head here. 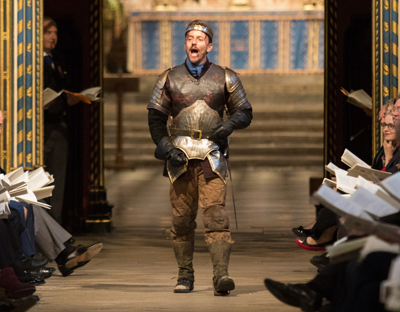 • Sir Mark Rylance will bring the words of Shakespeare to life in six special performances at Westminster Abbey this April. All Places that the Eye of Heaven Visits will feature a cast of 23 actors from Shakespeare’s Globe performing extracts from some of the Bard’s most famous plays and poetry. The performances will occur over 26th to 28th April. Tickets go on sale on 29th January via the Shakespeare’s Globe box office. 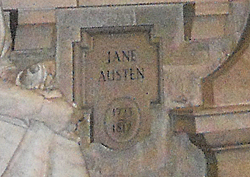 Jane Austen died in Winchester, Hampshire, on 18th July, 1817, at the age of just 41. She was buried in the city’s cathedral but a small tablet was unveiled in Westminster Abbey to mark her death 150 years later. Located in Poets’ Corner in the abbey’s south transept, the small tablet was erected on 17th December, 1967, by the Jane Austen Society. Made of polished Roman stone, it simply bears her name and year of birth – 1775 – and year of death. The tablet was placed on the lefthand side of the (much larger) memorial to William Shakespeare and below that of lexicographer Samuel Johnson. This is the final in our series on Jane Austen’s London – we’ll be starting a new series shortly. • London’s obsession with ice-skating is the subject of an exhibition which opened at the Museum of London earlier this month. Skating on Ice looks at the history of the popular pastime, from the 12th century – when locals are described strapping animals bones to their feet to skate on ice at Moorfields – across the centuries (and the developments that went with them) to today. Among the artefacts on show is an 1839 oil painting by J Baber depicting skaters on the Serpentine in Hyde Park, sketches from the London Illustrated News showing a rescue operation to recover the 40 of some 40 skaters who plunged beneath the ice in Regent’s Park on 15th January, 1867, a navy blue gabardine skirt suit from Fortnum & Mason dating from the 1930s and a series of skates, ranging from some made of animal bones through to a pair of Victorian racing skates known as Fen Runners and a pair of ice skates used from the late 1930s by Londoner Christina Greenberry at Streatham Ice Arena. Runs until 8th February. Entry is free. See www.museumoflondon.org.uk for more. 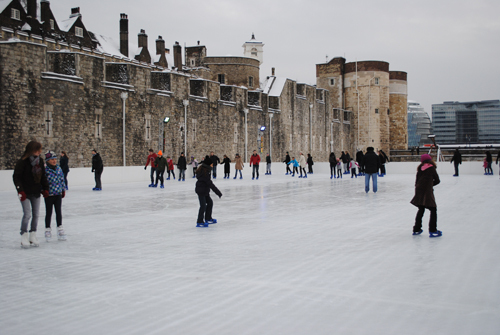 (Pictured – ice-skating in the Tower of London moat). Covent Garden. Always a glittering treat (this year complete with virtual prizes!). St Pancras International. A rather odd design this year, this 100 foot tall tree is inspired by the Cirque du Soleil show Amaluna and lights up every time a donation is made to Oxfam. Granary Square, Kings Cross. Looking like a Christmas tree frozen inside an ice-cube, this seven metre high installation – Fighting fire with ice cream – by British artist Alex Chinneck features some 1,200 lights. Tate Britain, Millbank. An upside down tree, designed by Iranian artist Shirazeh Houshiary. Connaught Hotel, Mount Street, Mayfair. Designed by British sculptor Antony Gormley, this 57 foot tall tree features a trunk transformed into a pillar of light. • Prince Charles last week unveiled the foundation stone for a tower that will take visitors to Westminster Abbey into the institution’s new museum and galleries. 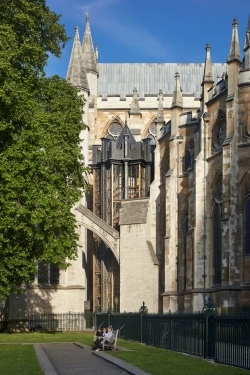 The tower is being built outside Poet’s Corner – between the 13th century Chapter House and 16th-century Henry VII’s Lady Chapel – and will be the principal entrance to the medieval triforium, which has never before been opened to the public and which house the proposed The Queen’s Diamond Jubilee Galleries. The tower and galleries, costing almost £23 million, will be the most significant addition to the abbey since Nicholas Hawksmoor’s west towers were completed in 1745. The galleries, which will be located 70 feet above the abbey’s floor, are due to open in summer 2018, and will display treasures from the abbey’s history as well as offering magnificent views of Parliament Square and the Palace of Westminster. To help meet the cost of the new galleries, the abbey has launched a #makehistory campaign asking for public donations to the project. For more, see www.westminster-abbey-galleries.org/Content/Filler. • The Imperial War Museum in Lambeth is holding a free late night opening tonight featuring live music, film screenings, immersive theatre and poetry to mark the 100th anniversary of the Battle of the Somme. Highlights of Night Before the Somme, which runs from 8pm to midnight tonight, include slam poet Kat Francois’ critically acclaimed play Raising Lazarus, poet and broadcaster Ian McMillan’s show Magic Lantern Tales, and extracts from the immersive production Dr Blighty – which tells the story of the million Indians who travelled to fight in the war. Visitors will also have the chance to watch the film, The Battle of the Somme (filmed and screened in 1916, it was the first feature-length documentary about war), listen in to a series of Q&A’s with experts on the battle, and preview the major exhibition, Real to Reel: A Century of War Movies. Real to Reel, which officially opens on Friday, explores how film-makers have found inspiration in compelling personal stories and the real events of wars from the past century. As well as audio-visual installations, the display features film clips, costumes, props, scripts, sketches and designs from films such as The Dam Busters, Where Eagles Dare, Apocalypse Now, Battle of Britain, Das Boot, Casablanca, Jarhead, Atonement and War Horse along with original archival material and artefacts from the IWM collections. The exhibition, which is divided into five sections, runs until 8th January. Admission charges apply. See www.iwm.org.uk for more. PICTURE: © IWM (Q 70164. 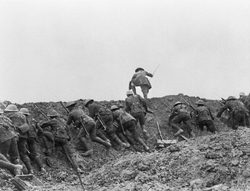 Staged scene from The Battle of the Somme film, 1916 British troops go ‘over the top’ into ‘No Man’s Land’. This scene was staged for the camera at a training school behind the lines. • Don’t forget tonight’s vigil at Westminster Abbey to mark the 100th anniversary (as mentioned in last week’s entry here). • Still on the centenary of the Battle of the Somme and a new exhibition opened at the Science Museum in South Kensington this week focusing on the innovations in medical practice and technologies developed as a result of the new kind of industrialised warfare seen in the battle. Wounded: Conflict, Casualties and Care has at its centre a collection of historic objects from the museum’s World War I medical collections including stretchers adapted for use in narrow trenches and made-to-measure artificial arms fitted to the wounded in British hospitals as well as lucky charms and personal protective items carried by frontline soldiers. There are also artworks from the period including Henry Tonk’s famous pastel drawings of facial injuries and a 1914 painting by John Lavery that depicts the arrival of the first British wounded soldiers at the London hospital. Admission is free and the exhibition can be seen until early 2018. For more, see www.sciencemuseum.org.uk. • Regent Street will be transformed on Sunday, 3rd July, with the Transported by Design Festival featuring transport designs which have shaped and will shape London. The festival, which will stretch from Piccadilly Circus to Oxford Circus Tube stations, will see the street divided into three zones – past, present and future. Among the objects on show in ‘past’ section will be a horse-drawn bus and other heritage buses, a 1927 train carriage and an exhibition of classic advertising posters and signage while the ‘present’ section will feature ‘Cycle Spin Fun’ by Santander Cycles, Moquette Land – a showcase of fabric used across the transport network, and, a ‘design a bus’ competition, and the ‘future’ section will feature a range of technologies, including virtual reality headsets, exploring what transport could look like in 2040. The free festival, part of the ‘Summer Streets’ program which sees Regent Street closed to traffic on Sundays over summer, runs from noon to 6pm. For more, see www.tfl.gov.uk/campaign/transported-by-design/event-calendar?intcmp=40582. • The work of artist Winifred Knights, the first British woman to win the Prix de Rome scholarship, is the subject of a recently-opened exhibition at the Dulwich Picture Gallery. The display, the first major retrospective of the work of Knights (1899-1947), brings together more than 70 preparatory studies and her most ambitious works including The Deluge (1920), The Potato Harvest (1918) and Leaving the Munitions Works (1919). Winifred Knights (1899-1947) runs until 18th September. Admission charge applies. For more, see www.dulwichpicturegallery.org. • Westminster Abbey is to remain open all night next Thursday (30th June) for a vigil in commemoration of the 100th anniversary of the Battle of the Somme. It’s the first time the abbey has been open for an all-night vigil since the Cuban missile crisis more than 50 years ago. The vigil around the Grave of the Unknown Warrior will be mounted from 8.45pm next Thursday, 30th June, through to 7.30am on Friday, 1st July (last entry to the abbey is at 7.15am). The public are invited to attend the vigil following an evening service at 8pm on Thursday which will be attended by Queen Elizabeth II and broadcast live on BBC Two. The vigil, which will end with the firing of World War I guns in Parliament Square by The King’s Troop Royal Horse Artillery, will see a series of 15 minute watches kept by service personnel and community groups representing those involved in the battle and there will also be readings from contemporary accounts. No tickets are required and entry, which is free, is via the abbey’s visitor entrance at the North Door. For more, see www.westminster-abbey.org. • Ever wondered what attracts artists to collect particular paintings? Answers abound at a new summer exhibition opening at The National Gallery today. Painters’ Paintings’: From Freud to Van Dyck features a series of ‘case studies’, each of which is devoted to works gathered by a particular ‘painter-collector’ including Lucien Freud, Henri Matisse, Hillaire-Germain-Edgar Degas, Frederic, Lord Leighton, Sir Thomas Lawrence, Sir Joshua Reynolds and Sir Anthony van Dyck. 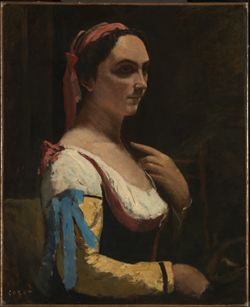 The display was inspired by Jean-Baptiste-Camille Corot’s work Italian Woman which was left to the nation by Lucien Freud following his death in 2011. “It made us start considering questions such as which paintings do artists choose to hang on their own walls,” explains Anne Robbins, curator of the exhibition. “How do the works of art they have in their homes and studios influence their personal creative journeys? What can we learn about painters from their collection of paintings? Painters’ Paintings’: From Freud to Van Dyck is the result.” The exhibition features works from the gallery’s own collection as well as loans from public and private collections. Admission charges apply. Runs until 4th September. For more, see www.nationalgallery.org.uk. PICTURE: Jean-Baptiste-Camille Corot’s Italian Woman, or Woman with Yellow Sleeve (L’Italienne) about 1870/© The National Gallery, London. • The East End Canal Festival takes place at the Art Pavilion, Mile End Park this Sunday. The programme, being run by the Friends of Regent’s Canal, includes boat trips as well as guided canal history walks and a range of performances, films, stalls, exhibitions featuring historic photos and locally made artworks, children’s activities and food. The festivities at the Clinton Road site are free. For more, see http://friendsofregentscanal.org/events/eecf.html. It was 75 years ago this year – on the night of 10th/11th May, 1941 – that the German Luftwaffe launched an unprecedented attacked on London, an event that has since become known as the ‘Longest Night’ (it’s also been referred to as ‘The Hardest Night’). Air raid sirens echoed across the city as the first bombs fells at about 11pm and by the following morning, some 1,436 Londoners had been killed and more than that number injured while more than 11,000 houses had been destroyed along and landmark buildings including the Palace of Westminster (the Commons Chamber was entirely destroyed and the roof of Westminster Hall was set alight), Waterloo Station, the British Museum and the Old Bailey were, in some cases substantially, damaged. The Royal Air Force Museum records that some 571 sorties were flown by German air crews over the course of the night and morning, dropping 711 tons of high explosive bombs and more than 86,000 incendiaries. The planes were helped in their mission – ordered in retaliation for RAF bombings of German cities – by the full moon reflecting off the river below. The London Fire Brigade recorded more than 2,100 fires in the city and together these caused more than 700 acres of the urban environment, more than double that of the Great Fire of London in 1666 (the costs of the destruction were also estimated at more than double that of the Great Fire – some £20 million). Fighter Command sent some 326 aircraft into the fight that night, not all of them over London, and, according to the RAF Museum, the Luftwaffe officially lost 12 aircraft (although others put the figure at more than 30). By the time the all-clear siren sounded just before 6am on 11th May, it was clear the raid – which turned out to be the last major raid of The Blitz – had been the most damaging ever undertaken upon the city. Along with the landmarks mentioned above, other prominent buildings which suffered in the attack include Westminster Abbey, St Clement Danes (the official chapel of the Royal Air Force, it was rebuilt but still bears the scars of the attack), and the Queen’s Hall. 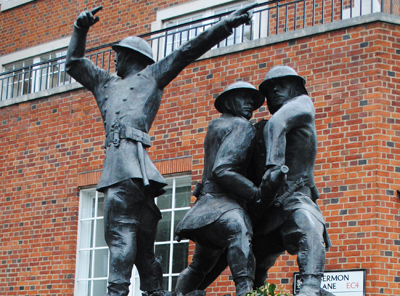 Pictured above is a statue of firefighters in action in London during the Blitz, taken from the National Firefighters Memorial near St Paul’s Cathedral – for more on that, see our earlier post here. For more on The Longest Night, see Gavin Mortimer’s The Longest Night: Voices from the London Blitz: The Worst Night of the London Blitz . • The biggest ever light festival to hit London opens tonight. Lumber London, produced by Artichoke with the support of the Mayor of London and visitlondon.com, will see a host of international artists transform a series of iconic buildings and locations in four areas across the city – Piccadilly, Regent Street and St James’s, Trafalgar Square and Westminster, Mayfair and King’s Cross. The 30 installations include French collective TILT’s Garden of Light featuring giant illuminated plants in Leicester Square, Patrice Warrener’s The Light of the Spirit which envelopes the west front of Westminster Abbey in colour and light, Deepa Mann-Kler’s Neon Dogs – a collection of 12 neon dogs inspired by the balloon dogs seen at children’s parties, this sits near Trafalgar Square, and, Pipette, a colourful installation by Miriam Gleeman (of The Cross Kings) and Tom Sloan (of Tom Sloan Design) which sits in the pedestrian subway, the King’s Cross Tunnel. Other highlights include Julian Opie’s work Shaida Walking, 2015 which will be permanently located in Broadwick Street, Soho, and Janet Echelon’s enormous net sculpture 1.8 London which is strung between buildings at Oxford Circus. The festival runs from 6.30pm to 10.30pm over the next four nights. You can download a free map on the installations or use the free London Official City Guide app to locate them. For more information – including the full programme – see www.visitlondon.com/lumiere. • A property deed signed by playwright William Shakespeare and one of the most complete first folios of his works have gone on show in the London Heritage Gallery at the Guildhall Art Gallery. Alongside the two documents which dates from 1613 and 1623, the Shakespeare and London exhibition marks the 400th anniversary of Shakespeare’s death – to be commemorated on 23rd April this year – will also display other documents related to the story of London’s playhouses. The property deed – which relates to a property in Blackfriars – is only one of six surviving documents to bear the playwrights authenticated signature while the first folio is one of five of the most complete copies in existence and is apparently usually only brought out for consultation by Shakespearean scholars and actors. The exhibition runs until 31st March. Admission is free. For more on it and other events being run to commemorate the Bard’s death, see www.cityoflondon.gov.uk/shakespeare400. For more on other events this year, check out www.shakespeare400.org. • See your art featured in an upcoming exhibition on the importance of bees and pollination by attending a drop-in workshop at Victoria Tower Gardens next to the Houses of Parliament next week. The workshop, which will be held from 10am to 2pm on 20th January, will see participants create their own 3D flowers based on famous paintings by Vincent Van Gogh and Jan Van Huysum currently in The National Gallery’s collection – all as part of a focus looking at what plants bees are attracted to. The art created in the workshop will be seen in an exhibition A Right Royal Buzz which is the result of a collaboration between The Royal Parks, The National Gallery and Mall Galleries and will be seen across all three venues (Victoria Tower Gardens representing the Royal Parks) from 17th t0 20th February. For more, head to this link. 2. 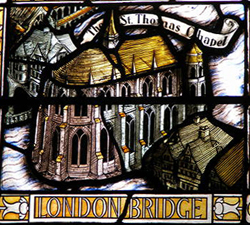 Our second most popular article, posted in August, was another in our Lost London series and this time looked at a long-lost feature of Old London Bridge – Lost London – Chapel of St Thomas á Becket. 1. And we are finally there – the most popular of our posts published this year was run in conjunction with the 600th anniversary of the Battle of Agincourt. Part of our LondonLife series, it took a look inside King Henry V’s rarely opened chantry chapel in Westminster Abbey – LondonLife – A rare glimpse inside King Henry V’s chantry chapel. 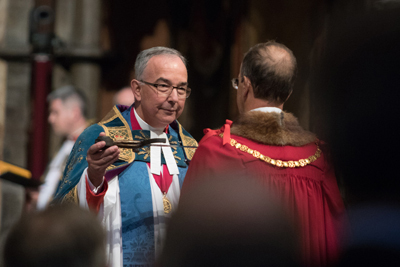 Hundreds gathered at Westminster Abbey last Thursday for a service to commemorate the 600th anniversary of the Battle of Agincourt – 600 years to the day when word of the battle’s victory arrived in London. 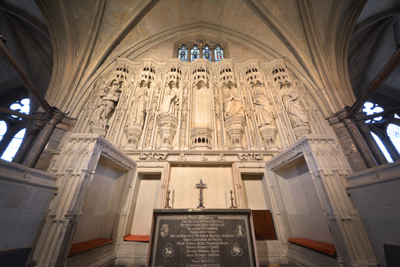 During the service, the sword of King Henry V – who was buried in the abbey and whose chantry chapel is located above his tomb (see our earlier post here) – was carried through the abbey and presented to the Dean of Westminster, the Very Reverend Dr John Hall, at the High Altar (pictured below). “A hundred years ago, as our countrymen fought alongside the French, the old enmities had been put away,” Rev Dr Hall told those at the service who included the Duke of Kent and Princess Michael of Kent. “In the dark days before the Second World War, the story of Agincourt encouraged men and women alike to strive their utmost for freedom from tyranny. Today we give hearty thanks for our freedoms, and we pray for an end to tyranny wherever it is found, and for enduring peace and prosperity.” Royal Shakespeare Company actor Sam Marks read the St Crispin’s Day speech from the Bard’s Henry the Fifth (pictured above) while veteran of the stage and screen, Robert Hardy, read the prologue from Act IV of the same play. For more on abbey, visit www.westminster-abbey.org. 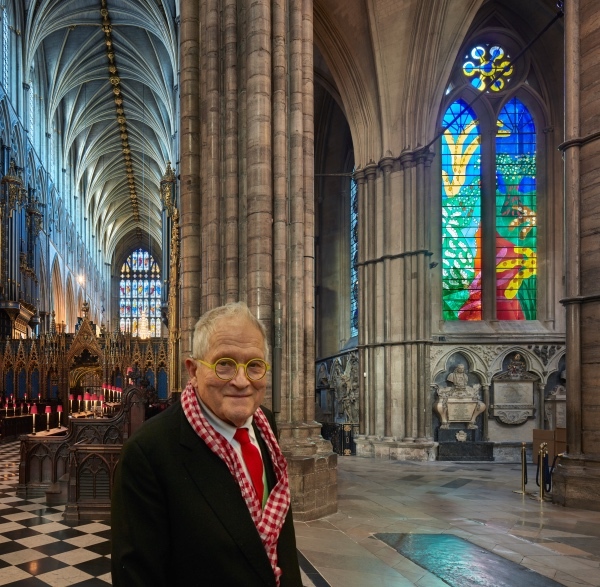 PICTURES: Ian Stratton/Westminster Abbey. It wasn’t until four days after the battle which had taken place on 25th October, 1415, that news of King Henry V’s stunning victory over the French reached the English capital. The news apparently reached London very early in the morning and church bells were rung in celebration and a Te Deum sang in thanksgiving in many. 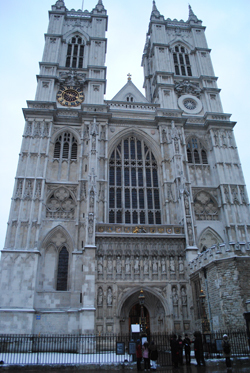 At 9am, a solemn procession of clergy made their way from St Paul’s Cathedral in the City to the shrine of St Edward the Confessor in Westminster Abbey (pictured) to give thanks. Other attendees at the abbey included the Mayor-elect, Nicholas Wotton (this was the first of two occasions on which he was elected Lord Mayor), and the alderman of London, as well as the Queen Dowager, Joan of Navarre. A few days later, on the 4th November, King Henry V’s brother – John of Lancaster, the Duke of Bedford, announced the news to Parliament. King Henry V, meanwhile, arrived back in Dover on 16th November (apparently as a great snowstorm was making its presence felt) and headed for London. After pausing in Canterbury to give thanks in the cathedral and St Augustine’s Abbey, he reached the manor of Eltham (now in south-east London) on 22nd November. He was met the next day on Blackheath by Wotton and City dignitaries who then, along with what were recorded as a crowd of 20,000 citizens, accompanied him and his small retinue, which included some of his most high profile prisoners such as Charles d’Orléans, Duke of Orléans (who spent 25 years as a prisoner in England), and Marshal Boucicaut (he would die six years later in Yorkshire), towards London. There, welcomed as Henry V, “King of England and France”, he processed through the City which had been elaborately decorated – the decorations included the hanging of various coats of arms from various prominent sites as well as the positioning of statues of the likes of St George – ahead of his arrival. Travelling down Cheapside, the king – who was modestly dressed in a purple gown and had eschewed wearing a crown for the event – stopped at St Paul’s where he performed his devotions, before proceeding to Westminster where he did the same before taking up residence for the night in the nearby Palace of Westminster. On the king’s orders, a solemn mass was held in St Paul’s the next day for the fallen of both sides. The victorious king had returned! A fortunate few last weekend had the chance to have a look inside King Henry V’s elaborately carved chantry chapel in Westminster Abbey as part of commemorations marking the 600th anniversary of the Battle of Agincourt. The chapel, which is located on a sort of mezzanine level above the king’s tomb at the east end of the Shrine of Edward the Confessor, is one of the smallest of the abbey’s chapels. It was constructed on the orders of the king – who died Vincennes in August, 1422, and was buried in the abbey on 7th November that year – so prayers could be said in perpetuity for his soul. The tomb was completed in 1431 and the chantry chapel was built above between 1437 and 1450. The latter is entered via narrow stairways of worn steps hidden inside a pair of stone turrets which flank the tomb. For centuries the Henry V’s funeral ‘achievements’ – the king’s saddle, helm and shield – were displayed on a wooden beam above the chantry chapel but these were restored and moved to the abbey museum in 1972. 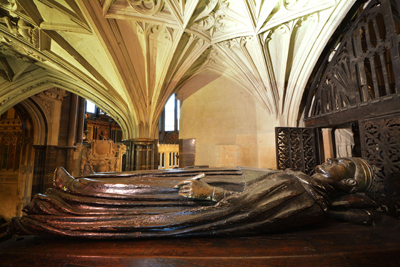 Henry V’s wife, Catherine de Valois, who survived her husband by 15 years was eventually – in the Victorian age – buried under the chantry chapel altar (originally buried in the old Lady Chapel, King Henry VII had her removed and placed in an open coffin in the open air next to the tomb of King Henry V, when building his new chapel – among visitors to her mummified body was diarist Samuel Pepys who even kissed her. In 1778 she was buried in a vault before being relocated to her current position in 1878). An inscription on the altar in the chantry chapel reads: “Under this slab (once the altar of this chapel) for long cast down and broken up by fire, rest at last, after various vicissitudes, finally deposited here by command of Queen Victoria, the bones of Catherine de Valois, daughter of Charles VI, King of France, wife of Henry V, mother of Henry VI, grandmother of Henry VII, born 1400, crowned 1421, died 1438”. The chantry chapel is still occasionally used for services but, measuring just seven by three metres, is not usually open to the public because of size and access issues. 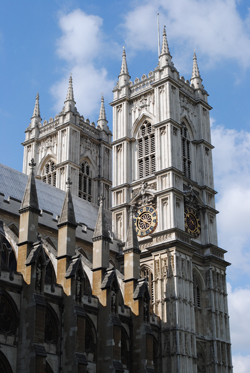 Westminster Abbey will hold a special service of commemoration on 29th October in partnership with charity Agincourt600. The day before, 28th October, it will host a one day conference for Henry V enthusiasts entitled ‘Beyond Agincourt: The Funerary Achievements of Henry V’. For more, see www.westminster-abbey.org/events/agincourt. • The world’s oldest clock and watch collection can be seen at its new home at the Science Museum in South Kensington from tomorrow. The Clockmaker’s Museum, which was established in 1814 and has previously been housed at City of London Corporation’s Guildhall, has taken up permanent residence in the Science Museum. Assembled by the Worshipful Company of Clockmakers – founded in 1631 – the collection features some 600 watches, 80 clocks and 25 marine timekeepers spanning the period from the 15th century to today. 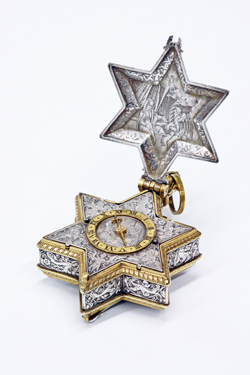 Highlights among the collection include: a year duration long case clock made by Daniel Quare of London (c. 1647-1724); a star-form watch (pictured) by David Ramsay, first master of the Clockmaker’s Company; the 5th marine timekeeper completed in 1770 by John Harrison (winner in 1714 of the Longitude Prize); a timekeeper used by Captain George Vancouver on his 18th century voyage around the Canadian island that bears his name; a watch used to carry accurate time from Greenwich Observatory around London; and, a wristwatch worn by Sir Edmund Hillary when he summited Mount Everest in 1953. The collection complements that already held by the Science Museum in its ‘Measuring Time’ gallery – this includes the third oldest clock in the world (dating from 1392, it’s on loan from Well’s Cathedral) and a 1,500-year-old Byzantine sundial-calendar, the second oldest geared mechanism known to have survived. Entry is free. For more, see www.sciencemuseum.org.uk/clocks. PICTURE: The Worshipful Company of Clockmakers. • Westminster Abbey is kicking off its commemorations of the 600th anniversary of the Battle of Agincourt by opening Henry V’s chantry chapel in Westminster Abbey to a selected few on Saturday night, the eve of the battle’s anniversary. The chapel, which is above the king’s tomb at the east end of the abbey, will be seen by the winners of a public ballot which opened in September. It has never before been officially opened for public tours. The chapel is one of the smallest of the abbey’s chapels. It is occasionally used for services but, measuring just seven by three metres, is not usually open to the public because of size and access issues. Meanwhile the abbey will hold a special service of commemoration on 29th October in partnership with charity Agincourt600 and on 28th October, will host a one day conference for Henry V enthusiasts entitled Beyond Agincourt: The Funerary Achievements of Henry V. For more, see www.westminster-abbey.org/events/agincourt. • The role the black community played at home and on the fighting front during conflicts from World War I onward is the focus of a programme of free events and tours as Imperial War Museums marks Black History Month during October. IWM London in Lambeth will host a special screening of two documentary films – Burma Boy and Eddie Noble: A Charmed Life – telling the stories of African and Caribbean mean who served in World War II on 25th October. IWM London will also feature a series of interactive talks from historians revealing what it was like for black servicemen during both world wars from this Saturday until Sunday, 1st November. For more, see www.iwm.org.uk.